If your target device is running Android 7.0 (API level 24) or higher, you can use this experimental feature with the Auto and Native debug types, and inspect Java and C/C++ code with a single LLDB process, as shown in figure 1. Figure 1. 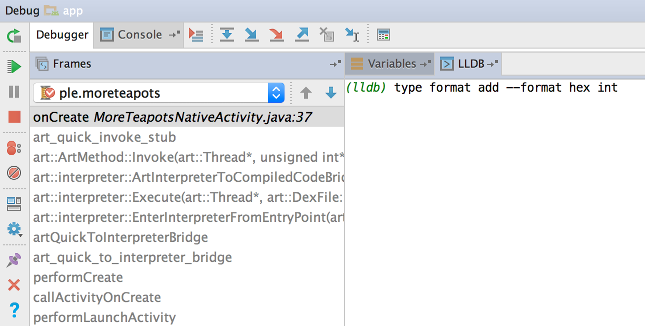 Debugging Java breakpoints with LLDB. Select your run/debug configuration and navigate to the Debugger tab. Select either Auto or Native from the Debug type dropdown menu. Check the box next to Experimental Java aware C++ debugger, as shown in figure 2. Figure 2. Enabling the experimental Java aware C++ debugger. The Auto debug mode only uses this feature if your project uses native code. 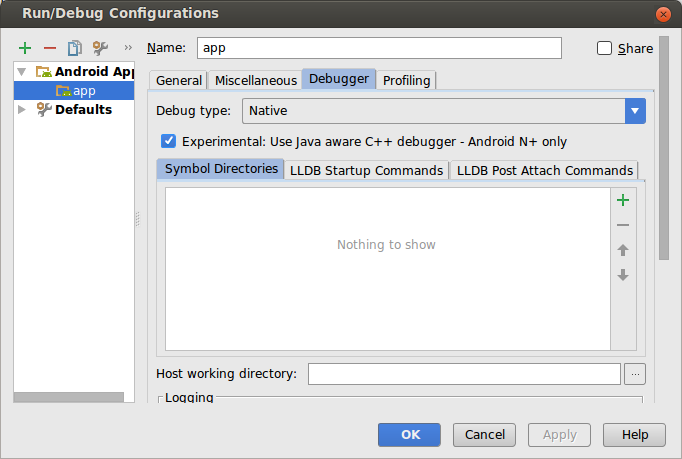 If you enable this feature with the Native debug type, however, Android Studio uses LLDB to debug all your breakpoints, even if you only have Java code in your project.